Tree removal represents far more than chopping at tree bark. This is precisely why Frank’s Lawn & Tree Service offers competitive Coral Gables stump grinding prices to our customers. Our stump grinding services require a process with varied steps that ensure that removing a tree stump runs as smoothly as possible. Frank’s Lawn grinds large stumps and small stumps, turning the inches of a former tree’s diameter into sawdust. The size of the stump demonstrates no concern to our professionals. We come accompanied by the proper equipment. This means standard grinders for small trees. However, a number of stumps demonstrating expansive size require a professional-grade large grinder. Our qualified arborists possess training to understand the fundamentals of different kinds of trees. This includes employing the most effective method to extract each one. Larger trees that represented fixtures on a property for many years will impart a large root system that spans further underground than the naked eye can see. For this reason, you should hire a professional stump removal company. These individuals will ensure that the tree removal process concludes correctly while avoiding any potential property damage. You can additionally abstain from needing to rent a stump grinder by hiring a professional service like Frank’s Lawn. Many of our customers come to us for help with these projects and expect to pay through the teeth for our services. While many companies charge exorbitant rates for tree stump removal cost, we enable homeowners to save money, keeping the average tree stump removal cost down with efficient, optimal methods. Why is Stump Removal Important? Stump removal is an often overlooked tenet of home improvement. The more important focus for these individuals concerns removing a potentially dangerous tree. Nevertheless, the additional stump that remains should not represent an afterthought. Our company can come in and turn this unwanted stump into wood chips, removing the debris upon conclusion. Despite potential issues with rocky soil condition, or difficulties grinding a stump at its widest point, no job is too large for the experts from Frank’s Lawn & Tree Service. Similar to tree removal, many methods exist to remove a stump. These unwanted stumps may serve as unsightly eyesores in an otherwise well-manicured expanse of greenery. Removing the stump at the ground level will improve the yard’s overall aesthetic, in addition, to ensure the surrounding plants remain healthy. When you leave a stump behind after a tree removal, this wood may become infected with potentially toxic fungi. If you continue to leave this untreated, the wood decay fungi may spread to other healthy trees. This cultivates an environment that is a breeding ground for unwanted pests and invaders. Removing a tree stump from your yard may require a permit. Most municipalities impose laws to keep individuals from removing too many trees. You may not know where you should begin obtaining this permit. The good news is that when you work with Frank’s Lawn & Tree Service, we take care of this for you. Our team completes any and all paperwork, overseeing any alteration is in agreement with local laws. We can operate in this capacity as an advocate on your behalf, avoiding potential complications throughout the tree stump removal process. 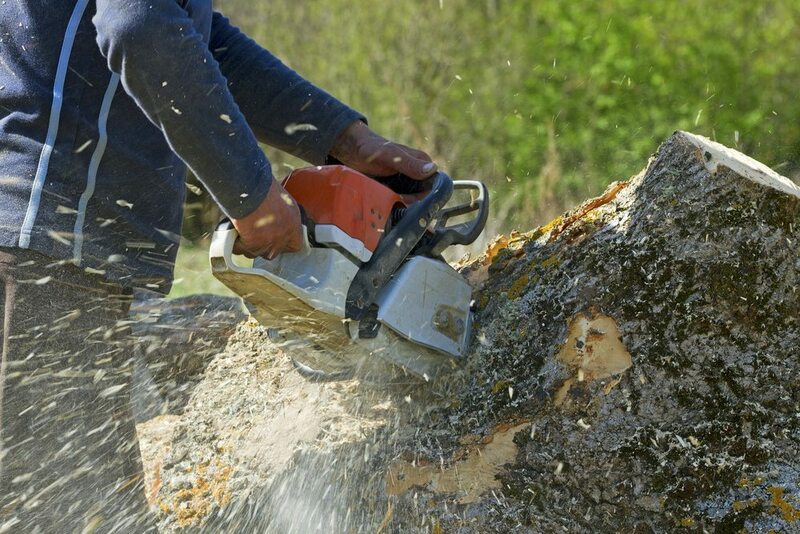 Once you remove a tree, our experts can grind down the stump. We employ specialized equipment to skillfully rid the land of any trace of the former stump and preexisting trees. Although completely removing a stump may seem impossible, our experts do not give in that easily. We can provide you with the best stump grinding services in the South Florida community. After our years of experience in the industry, we wield effective methods that function for virtually any situation. Throughout the years, our team took on massive projects. This includes clearing out land for new development projects. What posed a challenge for many other less competent teams was a breeze to our prepared experts. We understand how important following effective procedures is. For this reason, we include our customers in the decision-making process during each phase. Stump grinding serves as the ideal method to remove a stump. Hire a licensed and insured stump grinding professional that factors in your questions, concerns, and opinions in any decision. We ensure that you remove the stump safely and efficiently while avoiding any potential property damage. Get your trees removed the right way by enlisting a team of driven professionals. We can offer you a tree removal estimate during our initial meeting. If we agree, you allow us to get to work right away on your property. No matter the size or magnitude of the job, our team will evaluate every option you possess at your disposal while cultivating an optimal solution for your needs. Don’t enlist a friend, or attempt to accomplish tree stump removal on your own. You may discover that the job is too big, or the costs too great. Enlist a company that brings their own state-of-the-art equipment, showing up to the job in uniform and ready to work! For more information on our Coral Gables stump grinding prices and tree stump removal cost available to residents in the South Florida Community, contact Frank’s Lawn & Tree Service today to learn more! We want to help you utilize the space an unseemly tree stump accompanies. Furthermore, this may help you avoid potential unwanted pests and invaders, as well as afford you an elegant and luxurious expanse of greenery. If you need our available times, as well as an idea of what we charge for your concerns, call Frank’s Lawn & Tree Service today at (305) 233-9369 for a free estimate!